It was as I turned 29, just over a year ago, that I became skin care obsessed. I'm told that it's a normal stage in the run up to turning 30. I was exfoliating, moisturising, seruming, cleansing, oiling like a beast (not in that order obviously). Acids became my best friend. I fell for anything that claimed Glycolic/Salicylic/Hyaluronic properties. I didn't delve into the Retinols thankfully my problems aren't that severe! Over the course of the year I discovered that the horrible dry flakey scaley mess that was my face could be cured. Yes I will always have "Dry Skin" but combatting it became easier. Finding the right products helped. Exfoliating was key! 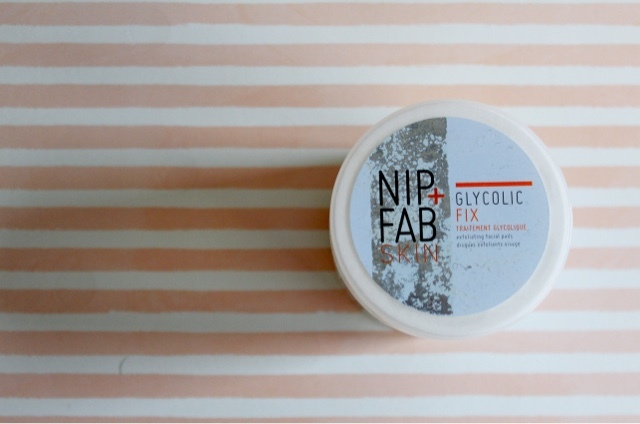 I fell for the Nip + Fab Glycolic Fix range, in particular their acid exfoliating pads. 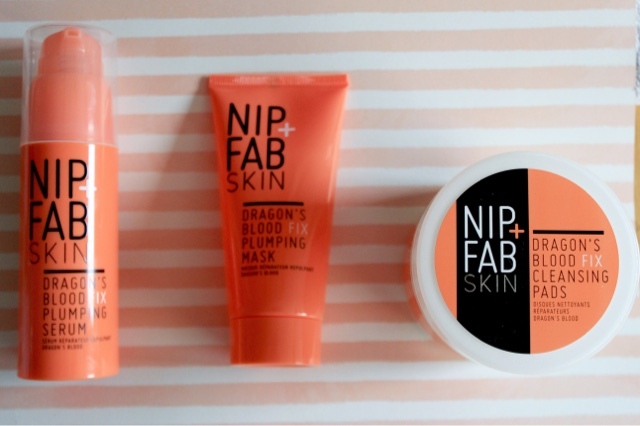 Rather than simply rubbing a load of hard micro beads across my face and irritating the skin, my skin was renewed through the use of these little acidic potions and I could finally enjoy both wearing and not wearing makeup with confidence. So with my love of acids, my love of Nip + Fab, and the dreaded 30 having passed without incident it was about time I found a new obsession right? Absolutely not! I have finally listened to all the advice I've been given since turning 13; Your skin care is vital. 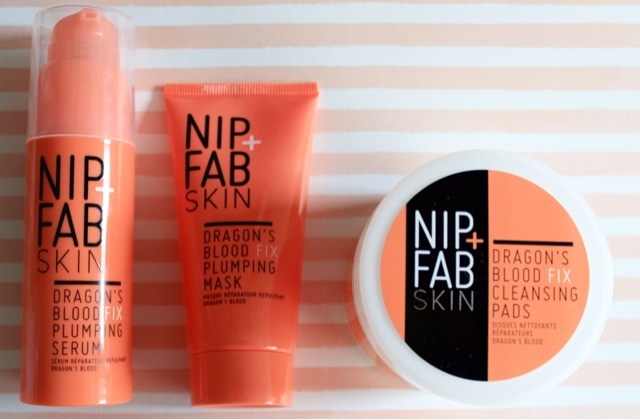 Thankfully my friends know me well and one of my birthday presents was this new Dragon's Blood range from Nip + Fab. I've noticed that blood seems to be a trendy word in the cosmetic world recently (I am also trialing a new liquid mineral Foundation called Young Blood). It makes sense. Blood is our life essence. What would we be without blood? Very hungry vampires that's what. So what is it? Well rather than Glycolic acid the Dragon's Blood range features both Salicylic and Hyaluronic (think Indeed Labs Hydraluron) acid. It also contains Witch Hazel, extracts from a plant called Celosia (Velvet Flower) which is an edible plant that is eaten through Africa and India and described as a "leafy green" similar to spinach, and of course Dragon's Blood (from the Croton Lechleri Tree) known in South America as the Sangre De Grado and is actually a natural latex produced by the tree in the form of a thick red sap and used in healing throughout the ages. It just all sounds good for you, doesn't it? The aim of the range is to moisturise and plump the skin. Anyone who's ever met knows that I have no issues looking "plump" but it does make my skin look very fresh and I can vouch for the moisturising effects. The mask for me is more like an every day moisturiser. This is how dry I am that I can use most moisture masks daily without worry or fear over hydrating, although I haven't combined it with the serum yet. That feels like overkill. The cleansing pads are great for a quick swipe in the morning and whilst I obvsiously wouldn't use them for removing a full face of makeup they are quite good at removing eye makeup without leaving any residue. It's safe to say I like this range and I love this brand (do I sound like I'm being paid to say this? I wish I was being paid to say this!) Their latest range is based all around super hip "super food" Kale and I have to say I'm intrigued. I've seen studies around kale that suggest that when eaten the only thing it's really good for is your eyesight so I'm thoroughly intrigued as to what skincare properties it has!